I was very spoilt on this AMAZING trip to Myanmar. The Strand Cruise and the Strand Hotel Yangon are stunning!! 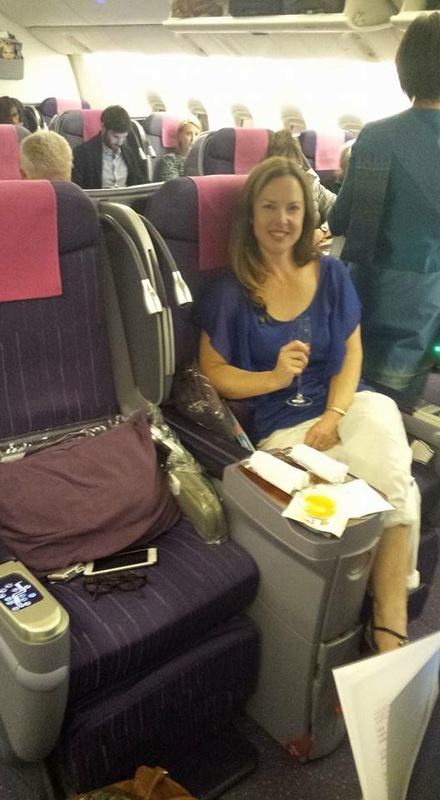 We travelled with Thai Airways in Business Class on the way over and Economy Class on the way back. The service was really good, and the food was great too. It was the best way to start the journey with access to the THAI Business Class Lounge before stretching out in my luxurious seat. In economy the seats were comfy and had a good selection of entertainment, along with the friendly THAI service. The domestic flight in Myanmar was a new experience! At the check in for domestic flights they don’t use computers. You are given colour coded stickers that relate to your flight!! It was also my first time on a propeller aircraft. The Strand Cruise ~ WOW ~ We were met at the airport and transferred to the ship by The Strand, which was the beginning of an amazing experience. As you board the ship you are given cold towels and they take your shoes which was a nice touch. They do this every time you board and the ship stays immaculate! My cabin (101) was a the back corner of the ship, so was a bit larger than the others. I would recommend it to anyone. Inside the cabins the beds and pillows are heaven. Big sliding doors to enjoy the view and scenery passing you by! There are 26 cabins on board, so usually around 50 passengers, with just as many staff. The staff are wonderful and all the leaders are French. The ship has a pool which is nice and refreshing, a great way to relax after a day of sightseeing. The upper deck is a lovely area of the ship and also the best place for wifi. There is a beautiful air-conditioned bar and restaurant and the food is amazing. I wasn’t ever hungry and basically went from one meal to another!! A true foodies heaven! Modern style décor, except for the bar which was an English library décor old world charm. There were only 16 guests on our ship with a range of demographics so we had a mum and 30ish daughter, a 40ish couple from Singapore, an English couple in their 70’s with a solo travelling friend and 3 French women in their late 40’s so quite a mix. Cruising isn’t allowed at night, so they anchor somewhere quiet every night. Yangon reminded me of Kuala Lumpur with lots of gardens and lakes. We had a chance to walk around the colonial quarter which shows their French influence, and The Strand Hotel is here. Strand Hotel Yangon just completed a massive renovation and it looks stunning. Old world charm and just beautiful. Large rooms with high ceilings. Next to the Australian Embassy if anyone has any problems. You can walk out the door to markets. Highly recommend. I wasn’t a big fan before, but it has really developed since I last visited. We did a tour which consisted of a river cruise, but then went up through the canals which was really interesting and unexpected. Both wealthy and not wealthy living side by side. Then we had a tuk tuk ride to a hotel on the river for lunch. Bit of fun. I had always preferred the river area, but I really found the Siam area great. You can walk to Central Shopping Centre, and it has a Sky Train stop out the front. It is a lovely hotel and the rooms large and luxurious. They also provide a smart phone for everyone to use in Bangkok. Pool was lush and tropical even in torrential downpours. Aqua restaurant for breakfast has indoor or outdoor seating. It is very popular for after dinner drinks with the locals and expats. We had our last dinner in the Spice Market and they bought up a course from each of the restaurants in the hotel. Food was excellent. You wouldn’t even need to leave the hotel if you didn’t want to! This was the bees knees for me. Next door to the Anantara Siam. Gorgeous. The lobby smells so good. They have their own scent which you can buy!!! Rooms lovely like the Anantara next door, but their added touch was the St Regis Butler Service which can be contacted via the WhatsApp. They can be reached at anytime if you have a question. If you are lost they can get you back to the hotel, if you don’t know how much to pay for something, take a photo and they will let you know. Very cool. The bar overlooks a golf course which is a very relaxing way of winding down at the end of the day. The visa for Myanmar is super easy. USD50 and the link is: www.evisa.moip.gov.mm Upload a photo and they send a confirmation letter within 48 hours. My love for travel developed from spending my childhood years growing up in Hong Kong and Singapore – my Dad was based there as a pilot. I’ve travelled extensively through Europe and more recently through Asia with my young family. A family highlight was America to include Disneyworld and New York. My favourite cities are New York, Prague & Paris. Aside from America, my most amazing trips have been on safari in Kenya and visiting the amazing palaces in Russia. My bucket list would be The Kimberley & Patagonia in Chile.